UGLY & DELICIOUS presents a funny and shamefully relate-able micro-mini series. Writer/performer duo Nick Casalini & Muriel Montgomery (aka Ugly & Delicious) created Spirits as a way to bridge the gap between the short-form world of comedy and the new golden era of hour-long serial television. Ugly & Delicious has been performing sketch, improv and stand up comedy in Chicago since 2008 and wanted to bring together a team of their talented friends to tell this kind of story. Maybe you'll even want to check out uglyanddelicious.com because the internet is interesting. Spirits was made with 100% love. 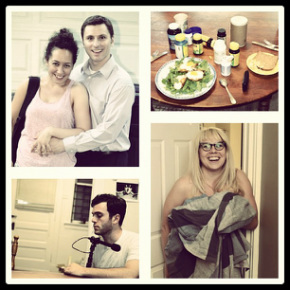 This sketch was written by Matt Griffo, Anna Schlegel & Erin Johnson. The lyrics have not been altered from the original; "Game On" by the First Love Band because they are so much better than anything we could have written satirically.